SHTFplan.com Editor’s Note: It is apparent that the Federal government was under the impression that they could simply move into the ranch land surrounding Bunkerville, NV and have their way with the property and livelihood of the Bundy family. What they didn’t count on was the outcry from Americans across the country. And now things may be headed to the next level. As Kim Paxton of The Daily Sheeple notes, citizen militias in several states have been called up. Many members of those organizations are taking up arms and are making their way to Nevada. At last count there were some 200 federal agents from various agencies on the ground in Nevada and it appears that hundreds, perhaps thousands, of armed militia members will soon arrive to confront them. The Federal government will no doubt step up their efforts, as they are facing the possibility of a widespread rebellion resulting from their actions against a private citizen whose only “crime” was to graze his cattle on the land his family has used for this purpose for over a century. It would not be at all surprising to see the President of the United States call up National Guard troops and more militarized law enforcement officials for fear of having this spiral out of control. A declaration of martial law to go along with already established First Amendment Areas is not out of the question. We may well be on the cusp of a serious stand-off involving thousands of people. Keep in mind that most of them will be armed. Given the circumstances, things could turn very bloody very quickly. 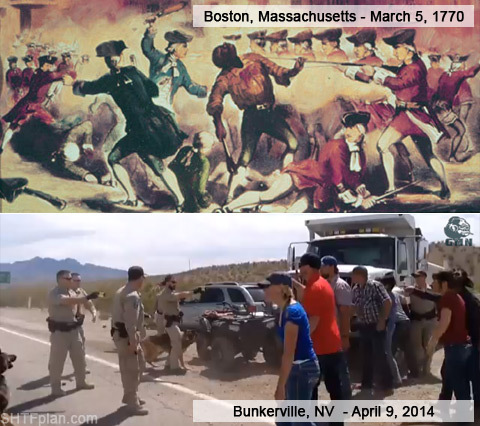 Militias Are On Route: Is the 2nd American Revolution Starting in Bunkerville, Nevada? An area just outside of the little town of Bunkerville, Nevada, with a population of around a thousand people, may go down in history. This little spot in the desert may be compared with Lexington, Massachusetts, the site of the “shot heard round the world” – the first shot fired in the American Revolution. Because it looks like the second American Revolution may start there…and soon. Yesterday, The Daily Sheeple reported that tensions were running high outside of Bunkerville. It seems that the US government, in all of their infinite wisdom, has declared war on a cattle rancher named Cliven Bundy. In a stand-off that has been likened to Ruby Ridge and Waco, the federal government has now deployed armed agents in a case of what the U.S. Department of the Interior’s Bureau of Land Management (BLM) has deemed “trespass cattle,” escalating a 20-year battle over grazing rights and what actually constitutes “public land” use in Southern Nevada. 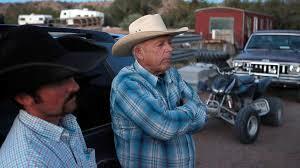 Armed federal officers have arrived to steal Bundy’s cattle and close down the land he is using. What’s more, they have declared a zone around the area to be free of the restrictions of the Constitution, specifically, the First Amendment right to assemble and speak freely. They’d like to keep their reprehensible actions quiet and out of the public eye. It’s really difficult to mow down a bunch of protesters ala Waco with the whole world watching. Yesterday, tensions began to rise even further and numerous protestors were tazed and assaulted. (You can see the actions of those brave BLM officers on this video HERE). It looks like tensions will rise even further because Americans have had enough. Militias have been mobilised. It’s going to get real. Bundy may be facing down a bunch of armed federal thugs but he’s going to be backed up by militia members from across the country. This is the day that Patriots have been talking about and training for. They will not stand down. CBS reports that militias from Texas, Montana, Utah, New Hampshire, and Florida will be standing with Bundy against the Bureau of Land Management. If you aren’t a combatant, this doesn’t mean that you can’t participate in this revolt against tyranny. This is a call to action. Share information in support of these people who refuse to stand idly by while theft, violence, and tyranny occurs at the hands of the government. If we all spread the word, there is no way that another Ruby Ridge or Waco can quietly occur. We can combat the disinformation spouted by the mainstream media by publishing REAL photos, REAL videos, and REAL accounts of what is happening. We can keep the communication open and tell the world what the United States government is doing to its own people. Share this and other stories through email, through social media, through links in the comments sections of mainstream news sites. Whatever you do, don’t wait for someone else to take action. Now is the time to speak up for liberty. Make this story too viral for the mainstream to ignore. Do not allow these brave people staring down the barrel of a gun to do so without our support. The Bureau of Land Management has picked up a snake by the tail, and it looks like that snake is going to bite. The confrontation, captured on video, resulted in one protester, the rancher’s son, being hit with a stun gun while another, the rancher’s daughter, was pushed to the ground. One woman said federal officials struck her with their vehicle. “You have no right to be here!” a female protester shouted at agents. One of agents warned the demonstrators to back up or they would get bitten by their K9 unit. “Don’t threaten a woman!” another protester shouted back. The U.S. Department of the Interior’s Bureau of Land Management and U.S. National Park Service confirmed in a statement that one protester was hit with a stun gun, adding that the action only occurred after a demonstrator attempted to block federal agents with an all-terrain vehicle. “A BLM truck driven by a non-law enforcement civilian employee assisting with gather operations was struck by a protester on an ATV, and the truck’s exit from the area was blocked by a group of individuals who gathered around the vehicle,” the agencies said in a statement. Content warning: video contains strong language. “These isolated actions that have jeopardized the safety of individuals have been responded to with appropriate law enforcement actions,” the agencies said. Agents from the Bureau of Land Management and National Park Service closed the Gold Butte area in Clark County, Nev., last week to remove 67-year-old rancher Cliven Bundy’s cattle from land controlled by the federal government, but put in place “First Amendment zones” for protesters to gather. Bundy does not own the land, which is near his 150-acre ranch, and has not paid grazing fees since 1993, claiming that he doesn’t recognize the federal government’s claim to the property. The veteran rancher said he is entitled to use the land for grazing because his family has done exactly that for decades, even before the Bureau of Land Management was formed. The federal government in 1998 declared the property off-limits to all cattle so that it could be turned into a habitat for the endangered desert tortoise. Bundy was ordered by a judge that year to leave the area. He refused. Agents from the Bureau of Land Management and the National Park Service were sent to the area last week only after federal authorities decided that all other options had been exhausted. Hudia said the few legal routes Bundy could have taken probably wouldn’t have helped him in his quest to use federal property for free. Meanwhile, the Nevada Cattlemen’s Association said in a statement earlier this week that it would not side with Bundy against federal officials. Though “sensitive and concerned how the Bundy cattle confiscation situation has evolved,” the statement said, the group is entirely uninterested in inserting itself into the fight between the U.S. government and Bundy. “Nevada Cattlemen’s Association does not feel it is in our best interest to interfere in the process of adjudication in this matter,” the group’s statement said. The Bundy family claims federal agents have also “surrounded” their ranch with snipers and have deployed heavy-duty military-grade weapons to the area. None of these claims have been confirmed by secondary sources. A spokeswoman for the Bureau of Land Management would only say that security personnel have been called on to ensure the safety of federal employees and contractors. Bureau of Land Management agents assaulted a cancer victim, set a dog on a pregnant woman and tasered Ammon Bundy during a confrontation yesterday as the dispute between Nevada cattle rancher Cliven Bundy, his supporters and the feds threatened to boil over. Video of the incident shows BLM agents exiting their vehicles near the intersection of Gold Butte Road and state Route 170, a few miles from the Bundy ranch. The BLM claims they were responding to a BLM truck being struck by a protester during an earlier incident. Protesters claimed the agents were there to “punish” them for daring to violate a “First Amendment Area” set up by the feds, outside of which free speech is banned. Armed with attack dogs and taser weapons, the BLM agents attempt to push the protesters back. Ammon Bundy, son of Cliven Bundy, was hit by a taser but supporters managed to pull out the barbs before he could be incapacitated. Cliven Bundy’s sister, Margaret Houston, was also thrown to the ground by a BLM agent. “I have 11 children, I’m 57 years old and they threw me to the dirt….I was just taking pictures, I just said get out of here,” said Houston, a recovering cancer victim, later telling a news station that she was also hit by a vehicle. According to the Las Vegas Review Journal, “serious bloodshed was narrowly avoided” during the confrontation. The Bundy family is currently under constant surveillance by around 200 armed federal agents in a military compound near the ranch. Authorities are enforcing a law that forbids grazing rights on federal land under the justification of protecting an endangered desert tortoise. Bundy and his supporters insist that the spat has nothing to do with unpaid grazing fees or tortoises and everything to do with an out of control big government asserting its power over patriotic Americans. 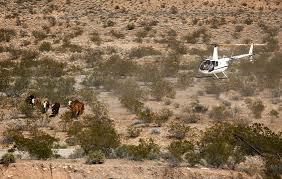 The feds have rounded up 352 of Bundy’s animals so far. Armed militia groups are now heading to the area to express support for Bundy while making assurances that they only intend to document the situation and have no interest in sparking violence. 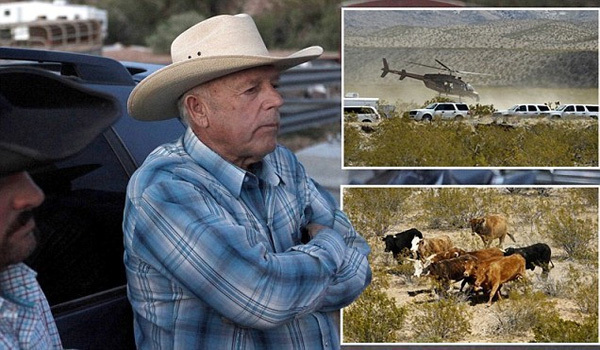 The Bundy family came face to face with the consequences of violating the free speech zone on Sunday when Dave Bundy was arrested for taking video footage from a state highway of BLM agents rounding up his family’s cattle. Video footage later proved that armed snipers had their guns trained on the family during the incident.